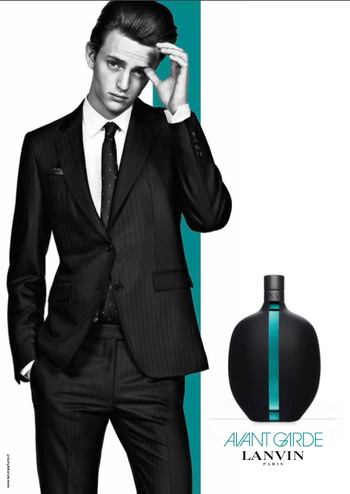 Lanvin, a fashion house with an illustrious history in perfume releases, is issuing a new masculine fragrance, called Avant Garde. "A woody, spicy and orientalised composition" developed by perfumer Shyamala Maisondieu (who's working at aroma-producing firm Givaudan) to be available in Eau de Toilette (50ml/1.7oz for 48 euros, 100ml/3.4oz for 70 euros and also in deodorant (18 euros). According to the perfumer: "The world that I’ve created for Avant Garde combines noble raw materials like vetiver and benzoin, with other surprising materials such as beeswax and tobacco. The spices? I have always loved working with them because you have to be able to handle them carefully to find the right amount, the right strength, of freshness, so that it is both spicy and incisive. I also played with a unique and powerful innovative note: Georgywood. This raw material, developed using the very latest technology, has woody amber tones which chime perfectly with the fragrance’s manly architecture”. Other notes include: Italian bergamot, Madagascar pepper, pink pepper and juniper, lavender, nutmeg, cardamom and beeswax absolute. The new masculine cologne by parfums Lanvin will launch in February (it's online at the official Lanvin Parfums site). The advertisement looks anything but "spicy and incisive", though, no?